The two-year Gies College of Business full-time MBA program begins in August. Every semester, MBA students work with external clients, learning to apply the business principles focused on in the classroom into a real-world setting. Students in the program may specialize in the more traditional business school focuses, such as marketing or finance. However, there are many less-traditional concentrations available, such as supply chain management, business data analytics, real estate, and many more. The first year of the Gies full-time MBA program is comprised of 40 course hours, eight of which are used for electives. The first semester is solely devoted to foundational business courses, covering subjects such as: accounting, data analytics, data analysis, marketing, and more. The flexible second year is made up of 32 course hours, half of which are devoted to core courses. The other half can be devoted to business courses or non-business courses of the student’s choosing. In total, students in the program are eligible to graduate upon the completion of 72 course hours. Over 3,000 graduate students are enrolled in the Gies College of Business, with 238 enrolled in the school’s MBA programs. The Gies MBA Class of 2021 features 49 individual students, 36 percent of which are women. On average, the class is 27-years old, with about 31 percent of students coming from outside of the United States. The mean GMAT score of the class is 670. Students enrolled in the program joined with an average undergraduate GPA of 3.32. The mean annual salary for the most recent Gies MBA class was $91,500 and the mean signing bonus was $13,975. Graduates from Gies earned positions at well known companies like Accenture, Amazon, At&T, Bank of America, Deloitte, GE, Goldman Sachs, Google, Microsoft, and more. Current tuition for the Gies College of Business full-time MBA program costs an estimated $57,618 for in-state residents and $82,026 for out-of-state residents. Multiple MBA scholarship opportunities are available to applicants, ranging anywhere from $2,500 to full tuition payment. 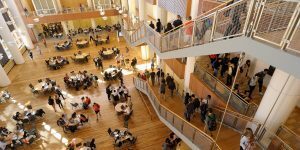 Certain University of Illinois graduates are eligible for the Illinois x 2 Scholarship, which reduces the tuition for MBA students by 50 percent. U.S. applicants to the MBA program are eligible for the FAFSA to fund their education, along with other federal aid. International student applicants are eligible for multiple funding opportunities, including Common Bond and Prodigy. In order to apply to the Gies College of Business full-time MBA program, applicants must submit a professional resume, official GMAT or GRE scores, two essays (one short and one long), two letters of recommendation, official college transcripts, and an application fee ($70 for U.S. applicants and $90 for international applicants). International applicants born in non-native English speaking countries may need to submit either TOEFL or IELTS scores for admission. Undergraduate juniors, seniors, or other non-graduate applicants may be eligible for the Illinois MBA Early Admit program, as long as the student has completed 75 credits of coursework.